Adderall is fantastic at spiking mental energy. The ability to boost focus & energy isn’t in itself evidence of optimized brain health & function. It’s just cheap stimulation (that often comes at a heavy price). Or at least that’s what AdderPlex hopes to convey with its stimulant-free, Adderall alternative nootropic formula. AdderPlex is all about boosting brain function, so that it naturally & automatically operates at a higher level. So hell ya! let’s supplement AdderPlex, right? But what if there’s a nootropic stack that can do all that but better? What about Mind Lab Pro? AdderPlex or Mind Lab Pro: Which is better? Based on these product designs, Blue & White is apparently the universal sign of a solid nootropic supplement. Yet, the similarities in design run only skin-deep (plastic-deep?) as there exists a wide variety of ingredients & bio-activities in these formulas, enough that simply qualifying these products as “cognitive enhancers” just doesn’t cut it. 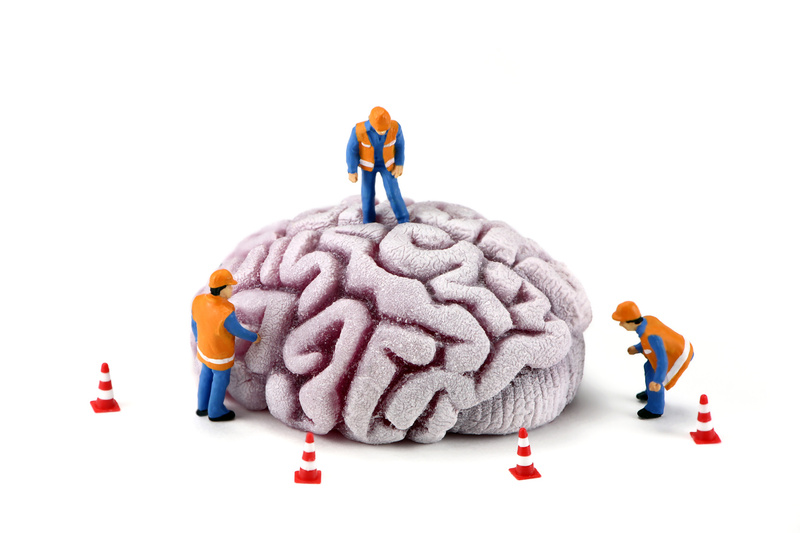 AdderPlex tosses out the junk, says screw even to the caffeine, relying instead on brain healthy nourishment in the form of circulation enhancing Ginkgo & Vinpocetine as well as memory-&-cognitive bumpers Bacopa, DMAE Bitartrate, and Phosphatidylserine. Then there’s St. John’s Wort for all of your happy happy feel-goods. Yet, while AdderPlex sells itself as a low-key Adderall alternative, I wouldn’t suggest viewing it as a “guilt-free” version of the Adderall experience: AdderPlex won’t massively enhance focus & energy. It’s a brain health & nutrition supplement that may help target the underlying structures of focus & attention, giving it solid value particularly for the older mentally impaired crowd. Read my in-depth review on AdderPlex. Mind Lab Pro is good, but you know what’s even better? The combined result of these being enhanced Memory, Performance, Mindset, & Brain Structure for, like I said, 100% brain power. It’s a universal nootropic with universal appeal to every one. (That sentence is redundant as hell.) Read my in-depth review on Mind Lab Pro. Ginkgo Biloba Extract. Not just for old folks no more, Ginkgo is a solid memory enhancer for both young & old. AdderPlex supplies a quality Ginkgo extract. Acetyl-L-Carnitine. ALCAR is the right carnitine form for crossing the blood-brain barrier, but seems to only help old folks with cognition. St. John’s Wort Extract. Considering a natural antidepressant, St John’s Wort is a feel-good herb, supplied here in a potent extract form. DMAE Bitartrate. Multipurpose nootropic believed to support acetylcholine, brain cell membranes, and agitated Theta brain waves. B Vitamins. Supplied in bio-available P-5-P (Vitamin B6) and methylcobalamin (Vitamin B12) forms for optimum B vitamin activity. Cognizin® Citicoline. Well-researched Cognizin brand of Citicoline, one of the best, if not the best, nootropics currently available. Bacopa Extract. Memory boosting jerb standardized to a potent 45% bacosides, the bio-active constituents of this Ayurveda adaptogen. Lion’s Mane. Mind Lab Pro supplies the full spectrum of Lion’s Mane Mushroom nerve growth factors. Sharp-PS® Phosphatidylserine. The Sharp-PS brand of PS opts for the soy-free, sunflower-derived PS, which is all the rage these days. Pterostilbene. More potent & bio-available than the more popular Resveratrol antioxidant. N-Acetyl L-Tyrosine. NALT is the bio-active form of L-Tyrosine, a reliable anti-stress amino during conditions of stress (e.g. exam day). Suntheanine® L-Theanine. Quality brand of Alpha brain wave boosting L-Theanine, a nootropic amino found in green tea. Rhodiola Rosea Extract. Standardized to 3% rosavins and 1% salidroside, Mind Lab Pro’s Rhodiola Rosea is to ready to resist some stress & fatigue. If you couldn’t tell already by the previous section, Mind Lab Pro massively outweighs AdderPlex in terms of positive unique features, most of which I determined by their potency & quality. This is usually a tough point of comparison for products lined up against Mind Lab Pro, because the supplement simply does everything right, cutting no corners on quality. And with quality comes potency comes bio-availabilty comes bio-activity. It’s just straight science, guys. Yet, to AdderPlex’s credit, it is a smaller formula than Mind Lab Pro, so naturally it’s going to have a shorter list of unique features to Mind Lab Pro. Even so, the ingredients that are shared between the formulas–Phosphatidylserine, Bacopa, and Vinpocetine–while they look good on AdderPlex’s side, they look even better in Mind Lab Pro’s formula (e.g AdderPlex’s 20% Bacopa Extract vs. Mind Lab Pro’s 45% Bacopa Extract). AdderPlex is an impressive nootropic stack, supplying high potent & high quality ingredients, but Mind Lab Pro is an impressiver nootropic stack, supplying higher potent & higher quality ingredients. AdderPlex is brain healthy but mild. As you age, mental power diminishes. AdderPlex helps restore mental function & balance lost over time to keep your brain chugging along well into your later years. Such formulas are invaluable to cognitive function, especially if they’re truly offering effective Adderall alternatives to those who need them. Mind Lab Pro is brain healthy & brain power. Mind Lab Pro quotes itself as the “Universal Nootropic” for its comprehensive range of brain boosting bio-activities, accomplished by a diverse roster of ingredients. I’d say they’ve earned this moniker, and will continue to earn this moniker if they keep fine-tuning their formula over time in light of new nootropic research, as they seem to be doing. 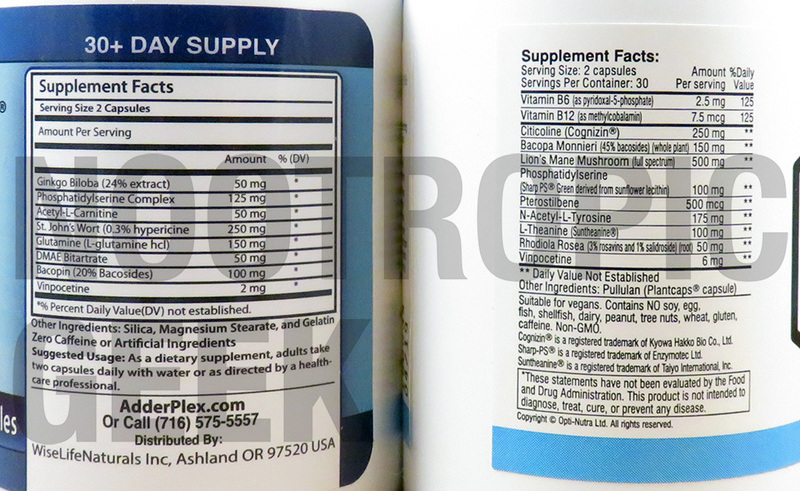 If you’re a Nootropic Geek regular (you damn well better be), then these comparative reviews between Mind Lab Pro and [any other supplement] may seem a little predictable, that prediction being: Mind Lab Pro wins. This is because Mind Lab Pro typically wins these comparative reviews. There simply hasn’t been a product to come along yet that outmatches this stack. And I’m saying this to avoid the impression that AdderPlex is a bad formula. Judging by the high count of positive customer reviews, this couldn’t be further from the truth. 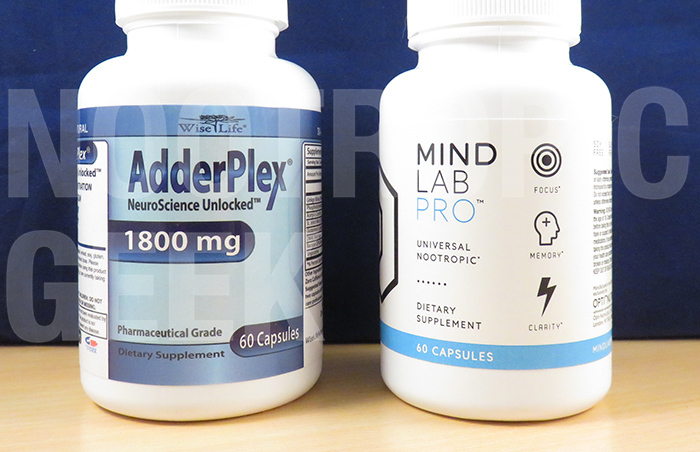 AdderPlex is a solid supplement full of solid nootropics backed by solid research. Perhaps you’ll choose it over Mind Lab Pro because you’re down for that St. John’s Wort or that DMAE. i am new to nootropic geek and i have been using mindlab for about a week. I just have a question on wheter it is safe to supplement mind lab pro with st johns wort? The only concern I’ve heard mentioned regarding St. John’s Wort with any of the ingredients listed in Mind Lab Pro is the interaction between St. John’s Wort & Rhodiola. However, I’ve supplemented the two in raw herbal powder form and have had no issues. Personally, I see no reason why MLP + St. John’s Wort can’t be done. If any issues do arise, removing one or the other should easily rectify the situation. Can Mind Lab Pro be used safely with Adderall?